The obvious main difference between interior and exterior solar screens in Charlotte is the location. What remains the same is an ideal way to protect your home from glare and UV damage, without the need to install screens every spring. This changes everything and has modernized the manner in which homeowners have to deal with window screens. First and foremost, what it helps to know is that you have a team of qualified and reputable experts available to provide you with the information you need. 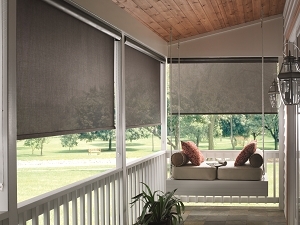 This makes it possible to make the right decisions for your window treatments. By making the wise choice to work with Sweet Shutters and Shades, you can rest assured that you are getting the superior quality service and products you deserve. Diane Sweet, founder and owner of our Charlotte shutter company, has a long, extensive and successful history working in the window treatment industry. This enables us to deliver the best results, earning our company the impeccable reputation that it has. Get in touch with us today so that we can tell you more about the options that you have, during your free in-home consultation. The main reason you want solar screens in place is to combat solar heat gain and UV damage. Solar heat gain causes your home to be less energy efficient which drives up your energy bills and causes your home to not be eco-friendly. UV rays are what can fade and damage flooring and furnishings, so keep your home protected. Another reason solar screens are so popular in the Charlotte area is they leave you with an unobstructed view. No one wants to install a window treatment element that blocks some or all of the panorama. Get the protection you need from a screen, without sacrificing the view. The smart thing to do is set up a time for your consultation so we can review all of this with you. Having quality UV-blocking solar window screens in place can vastly enhance your personal enjoyment of your home. We look forward to being a part of making that possible. Let the caring window covering experts here at Sweet Shutters and Shades provide you with the service that you need, for exterior solar screens in Charlotte and more. Get in touch with us right now so we can get your appointment time secured. You are going to love the final results we are able to provide for you. If you would like an estimate for exterior solar screens in Charlotte, NC or the surrounding areas, please call Sweet Shutters and Shades at 704-980-4303 or complete our online request form.